You know how, when someone disappears following an apparently fatal accident, everyone talks about their prospects with fake hope belied by occasional slippage into the past tense? 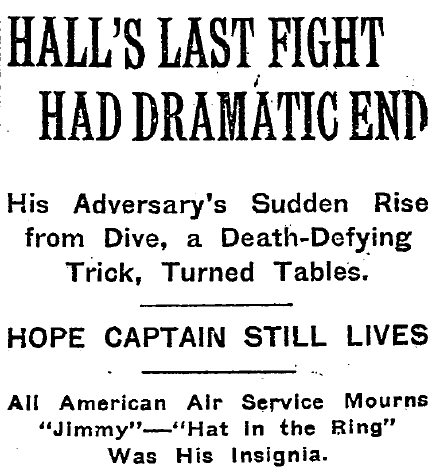 That’s what happened when American aviator Captain James “Jimmy” Hall was shot down by the Germans. Jimmy’s companions watched as his plane plunged toward the ground. They waited for several hours before returning to the hangar, where they talked bravely of his possible survival. At the time of Hall’s crash, the American air force was in its infancy. It went by the uninspiring name of “Aviation Section, Signal Corps,” although it would be rebranded the United States Army Air Service later in the month. The first American air squadrons had just arrived in April. Before that, a few American aviators, like Hall, had flown with allied forces. 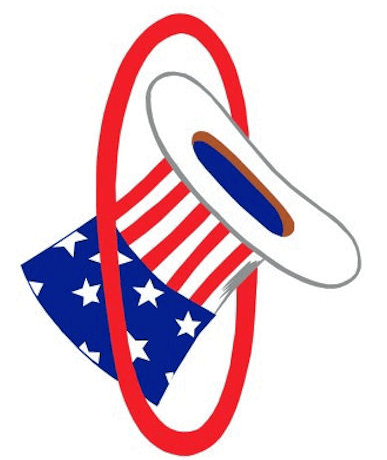 The Times noted that Hall’s plane bore the American aviators’ newly created “Hat in the Ring” insignia. Flight Captain James Norman Hall, reported as missing in France, fulfilled an oft-repeated wish for, after fighting under French and British colors, his final combat was as an American. Hall was 30 years old and his home was in Colfax, Iowa, where his parents live. Not only does he live, he goes on to co-write Mutiny on the Bounty. I bet you didn’t see that coming! Before we come to that, though, I’ll get you up to speed on Hall’s pre-war life. After attending Grinnell College in Iowa, he moved to Boston to be a social worker, studied for a master’s degree at Harvard, happened to be on vacation in England when the war broke out, enlisted in the army by posing as a Canadian, went to the trenches, got kicked out when his ruse was discovered, went back to the United States and began a career as a writer, was sent to France by the Atlantic Monthly to report on Americans fighting for France, got caught up in the cause and joined the Lafayette Flying Corps,** and joined the American army when the United States entered the war. After spending the rest of the war in German prisons, Hall was awarded the French Légion d’Honneur and the American Distinguished Service Cross. He moved to Tahiti and resumed his writing career. With fellow veteran and Tahiti resident Charles Nordhoff,*** he wrote Mutiny on the Bounty and its sequels, along with numerous other books. Hall and his wife, who was part Polynesian, had a daughter named Nancy and a son named Conrad. 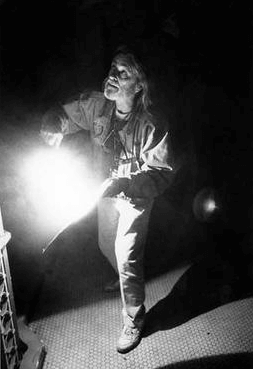 Conrad would go on to win three Academy Awards as a cinematographer, for Butch Cassidy and the Sundance Kid, American Beauty, and Road to Perdition. It’s one thing to realize in the abstract that each life lost in World War I, or in any war, erases what the person might have achieved in later life, the children they might have had, what their children might have achieved, and so on through time. But I’ve never seen this illustrated so vividly as it is here. 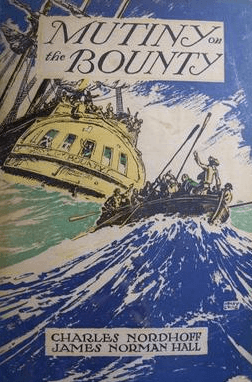 If Hall had died in that crash, we wouldn’t have Mutiny on the Bounty, or any of his other books, or any of the movies based on his books, or, at least in their current form, any of Conrad Hall’s movies. And that’s just one person. Ten million soldiers and five million civilians died in World War I. It makes you stop and think, doesn’t it? *Of course this is old hat to us because we’ve seen it a million times in the movies. **Which you’d think the Atlantic Monthly could have seen coming given his track record. This entry was posted in Books, Fiction and Poetry, In the News, World War I and tagged 1918, aviation, Conrad Hall, James Norman Hall, Mutiny on the Bounty, U.S. Army Air Service on May 12, 2018 by My Year in 1918. You never know what turns up when you google someone or something from 100 years ago. I once looked up a French ship sunk by an Austrian u-boat because I was bored and because you don’t read much about Austrian sub activity in the NYT. Turned out the captain was Georg von Trapp. That’s amazing! Those random connections are one of my favorite things about 1918. The world (of elite people, especially) was so much smaller then. One of my favorite discoveries was that Alan Dale, the apparently awful Hearst drama critic I wrote about in connection with his single-mother play “Madonna of the Future,” also turned out, decades before, to have written the first gay-themed novel in English. Oh wow! whenever I dip my toes into historical research, stuff like this just lights up the strange matrixes that connect things. I know, it’s spooky sometimes. A while ago I came across a 100-word story by an eight-year-old in St. Nicholas magazine, and it seemed awfully good for someone that age, and I Googled the kid, whose name was Edgar Pangborn, and it turned out that he became one of the founders of the “humanist” school of science fiction and influenced Ursula Le Guin. On the other hand, there are people who seem so promising in 1918 and I can’t find any trace of them in later years.